My wife, who has four sisters (and two brothers) tells me that she first heard Street Legal in 1978 when her sister, Louise, brought it home from a record shop. Apparently Louise was ridiculed for this decision by older sister Kate, who pronounced Dylan “lame” and “over”. I’m not sure if this family rift ever healed – with large families it’s tough to tell. The fact is that Kate was voicing the critical opinion of the day. Street Legal was greeted with a resounding critical thud. I just read Greil Marcus’s Rolling Stone review this morning and it is, to put it politely, uncharitable. Given the changes in popular music in 1978 – not just punk, of course, but also disco – Dylan with gospel-influence back-up singers and a sax player was another step too far for a lot of his fans. After three straight number one albums, this was the first full-length Dylan album to fail to make the top ten since 1964. He’ll basically have one more hit album (Slow Train Coming) and then nothing close to one for almost thirty years. This is the beginning of the dark period for Dylan. According to Marcus, actually, the dark period begins with Desire, which he thinks has only a single good song, and that this has none. In fact, he implies that this is worse than Self Portrait. I often find myself disagreeing with Marcus, and in this case my disagreement is strong. I actually think that Street Legal is a good album – not a great album like Blood on the Tracks and Desire, but still quite good. Most of the songs, as songs, are really well done (except, bizarrely the first two singles – “Is Your Love in Vain?” and “Baby Stop Crying”). Many of the songs return to Dylan to the heights of lyrical complexity that he attained in the mid-1960s (Marcus dismisses all of this as faux sophistication, as I say, uncharitable). I’ve already argued that “Changing of the Guards” is a great song, but I will give him credit for “New Pony”, “No Time to Think” (never played live! ), “Señor” (one of the highlights of the 1978 tour shows), “True Love Tends to Forget”, and “Where Are You Tonight?”. I actually think these are all well-written songs, and “We Better Talk This Over” is both well-written and well-played here. The big problem with Street Legal is that, like Desire, it is horribly produced. By all accounts the fault for this one lay with Dylan, who had written most of the material long before the album was recorded, and he just sort of rushed through it. The album was recorded at his rehearsal space, with improper sound baffling that basically eradicated the bass and made the sessions a nightmare for the recording staff. Dylan didn’t care. It’s pretty clear by now that Dylan puts pretty little emphasis on his albums as albums – they are just places that he puts his songs, and his songs are things that he works on in live performance. This seems to upset people like Greil Marcus (or it did at the time), but it doesn’t bother me one bit. (To be fair, I should also note that the version I have, from the Complete Album Collection, is remastered and that apparently the version that Marcus was reviewing was notably worse). I listened to a lot of live Dylan this week – like thirty hours worth – and a lot of these songs sound great live, or sounded great since he pretty much stopped playing almost all of them at the end of this tour. None of them sound as good on Street Legal as they do live, but Marcus’s inability to hear them as songs is his failing, not Dylan’s. There’s a lot of remarkable material here. Yes, some of it is buried under awful production and annoying sax fills, but that doesn’t take away from the fact that the songs themselves are actually really good. 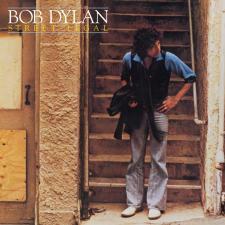 Nonetheless, 1978 was the beginning of the “dump on Dylan” period. Renaldo and Clara was a bomb, Street Legal was lame, and the tour, though an enormous success, was also critically derided. He had become terminally uncool. Louise never had a chance, but it’s not actually a bad album. There are two mixes of Street Legal – a remix by Don Devito was released in 1999 – it has a richer sound, where the different instruments are clearer. I much prefer it. They went back to the original mix on ‘The Complete Album Collection’ and listening to it again after a long time, it focuses much more on Dylan’s vocals – given the lyrical density, maybe that is understandable, but I still prefer the remix.